Spring Break is most often associated with debauchery and scores of bikini-clad college students partaking in a week-long break from spring semester studies — and while Texas certainly has that in spades, there are tons of great spots in the Lone Star State for families of school-aged children to enjoy, too. Whether you're looking for a beach vacation, a quiet reprieve in nature, or a wild underground adventure, Texas has several outposts worth a visit this spring — including some family-friendly options. Here are some of the best. It's tough to share a list of spring break hot spots in Texas and not kick it off with South Padre Island. Easily one of the best beaches in Texas to visit year round, this south Texas vacation destination is a veritable paradise. Spring break brings huge crowds of students to the island to surf, swim, fish, and frolic. Hotels on and near the island often offer spring break packages, and local establishments often host concerts, beach parties, and other events to entertain the large influx of visitors that come every spring. While kids are certainly welcome in South Padre at any time of year, spring break does tend to be more MTV than Mayberry. With throngs of college students and more than a bit of a debauchery, families with young children might want to visit one of Texas's other great spring break destinations instead. If crowds aren't your thing, escaping to Big Bend National Park can be a quiet reprieve. The massive park takes up more than 1,200 square miles along the Rio Grande River and features a host of outdoor and adventure activities, including river rafting, hiking, horseback riding and zip lining. Big Bend is also one of the best spots in the country for star-gazing, providing for excellent views of the clear night sky. While many visitors camp in or near the park, you can also rent a lodge or hotel room with more of the creature comforts you're used to. You can even book spa treatments, play golf, and take in live music if you feel so inclined. If not though, there is plenty of space to find solitude in the park's vast wilderness. Nestled just outside San Antonio, Cascade Caverns provide visitors a chance to glimpse beneath the surface of the Texas Hill Country. As one of the only "living" caves in Texas, tours of the underground space reveal a "diamond ceiling," dripping glistening beads of water onto the ground below. The cavern stays 64 degrees year around, making it a perfect place to beat the spring heat — plus, it features a 100-foot underground waterfall. The cavern sits on a 105 acre park where, after you've finished exploring, you can set out on nature trails or visit the area's playground. An underground wonder, Natural Bridge Caverns shows the family a side of the world they probably haven't seen. The bridge is named after a 60-foot natural limestone bridge that spans the entire length of cavern's entrance. Visitors can take one (or more) of a variety of tours through the ancient formations — including informational strolls passed centuries-old stalagmites, treks by lantern light, and journeys to some of the cavern's darkest spaces. In addition to a variety of subterranean tours, Natural Bridge Caverns offers a host of above-ground educational activities for kids of all ages. Try your hand at the site's obstacle course or zip line, mine for gold or fossils, or get lost in the site's massive maze. Visitors crossing the causeway to Galveston Island will surely see the pyramids rising on the western side of the island. Those pyramids are just part of magnificent Moody Gardens. With attractions that include several aquariums, an IMAX theater, zip line, and even a rainforest, Moody Gardens is a must see for Galveston visitors. After you're done, explore more Galveston or Houston-area sights. Moody Gardens is just a short drive away from the area's best beaches, as well as the Johnson Space Center and other great attractions. Whether you're a college student looking to blow off some mid-semester steam or a family wanting kid-friendly activities, Austin has a lot of interesting events and attractions to enjoy during spring break. Perhaps the biggest draw to the city in mid-March, however, is South by Southwest (SXSW) — a massive, multi-day event that includes concerts, film screenings, conferences, and trade shows. Past presenters have included prominent authors, world-famous philanthropists, megastar recording artists, and even vice presidents of the United States. The event is wildly popular with locals and visitors alike, and celebrity sightings are fairly common. Located just north of Austin, Inner Space Cavern reveals relics from the Ice Age. Bones of saber toothed tigers, mammoths and other Ice Age animals have been found in the cavern. Take a tour of the cave to learn more about its rich history and delicate rock formations. Treks range from easy strolls on well-lit trails to intense explorations of undeveloped sections of the cave. The latter is only available for adults or teens with accompanying parents and is only offered n the weekends, so be sure to call ahead for details and reservations. So named because of its rich history, Dinosaur Valley State Park offers some of the world's best preserved dinosaur tracks. Located in Glen Rose, the park features models of a 70-foot Apatosaurus and a 45-foot Tyrannosaurus Rex. If the weather's dry, try looking for the telltale dino footprints along the park's river banks. Five main sites have been mapped out to help visitors find the prehistoric tracks, including one nicknamed "the ballroom," because of the dancing-type patterns of footprints in the ground. Even if weather conditions are too wet to see them, Dinosaur Valley State Park also offers visitors a great opportunity to get outdoors and enjoy the pleasant spring weather. While many spring breakers will head to the Gulf to be near the water, Lake Texoma is a great bet for those who prefer their waves low and salt-free. In contrast to the balmy beaches of south Texas, this reservoir located on the Texas-Oklahoma border still has a bit of winter's bite during spring break — but that doesn't stop locals and visitors from having a good time. Here you can rent a cabin, do some fishing, ride out on a boat, and enjoy a little hiking or camping by the lake. It's not uncommon to spot a bald eagle or two while there — or a group of Dallas-area college students with a full cooler and plenty of antics. This 1,700-acre wildlife center, located in Glen Rose, is dedicated to preserving and protecting endangered and threatened species. Visitors can view more than 1,000 animals from their own car or on guided tours in open-air buses. From the comfort of your seat, you can watch rhinos sloshing in the mud and giraffes chasing each other around the large, open space. For a few extra bucks, you can even buy animal food at the front gate to hand out during your tour. This totally unique theme park is several different attractions in one. Incorporating a natural cave formed by an earthquake along the Balcones Fault Line, Wonder World Park offers cave tours, educational earthquake programs, a wildlife park, train rides and many more activities for the whole family. San Antonio's Six Flags Fiesta Texas offers the only "floorless" roller coaster in the southwest, plus over 100 different rides, shows, and other attractions. Fiesta Texas is Texas' most popular theme park and is just opening for the season when spring break arrives. No matter how old you are, you can enjoy serious (and not-so-serious) thrill rides, live music, and a water park. Schlitterbahn, one of Corpus Christi's newest attractions, is located on the island portion of the city. The fourth location in the Schlitterbahn Park chain across Texas, Schlitterbahn Corpus Christi is much more than just a water park. This location features not only a ton of great rides, but also a full-service hotel, the Veranda Restaurant, a golf club and tennis courts — making it as close to an all-inclusive resort as can be found along the Texas Gulf Coast. Longhorn Caverns are a Hill Country wonder that have housed Comanche Indians, Confederate Soldiers and, perhaps, and outlaw or two. Today the site is a state park, offering a number of tours and educational programs, including photography tours and a geology program. Tubing down a central Texas river is a right of passage for many Texans, and while most choose to wait until school is out to grab their tube and cooler and head to the water, spring break can be a great opportunity to get a jump-start on the state's favorite warm-weather pastime. Many debates can be had over the best spot to start your tubing adventure, but few would deny New Braunfels is a solid contender. 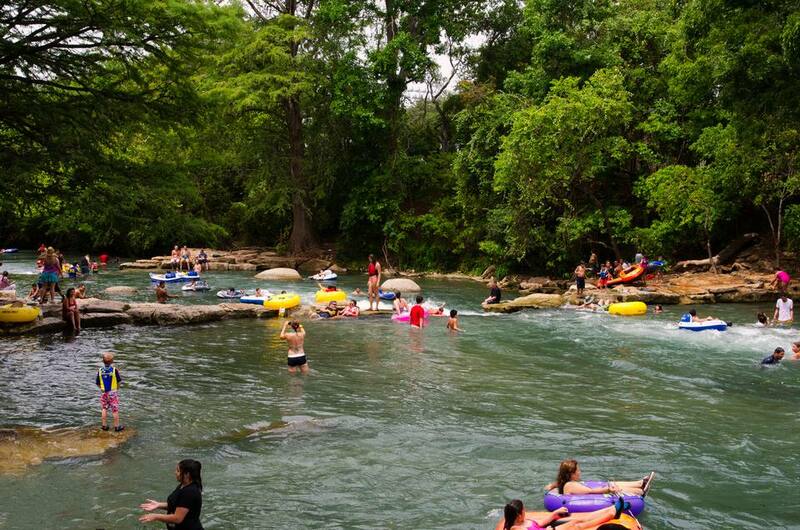 With access to both Comal and Guadalupe rivers and more than a dozen tubing outfitters, restaurants and lodging options, this small town near San Antonio is a popular place for tubing (or "toobing") enthusiasts.